It’s time for another installment in the baby prep series. Today we’re talking about car rides and how we’re keeping everyone comfortable and safe while traveling. All of the posts in this baby prep series are available here. As always, if you have any questions or suggestions, please share them in the comments. And if you have serious behaviour concerns or special needs particularly when adding a baby to your family, our best advice is to work with a reputable, professional trainer. When I go out, I try to take Baxter with me as much as possible. I knew that this was something I wanted to continue once our baby arrived. 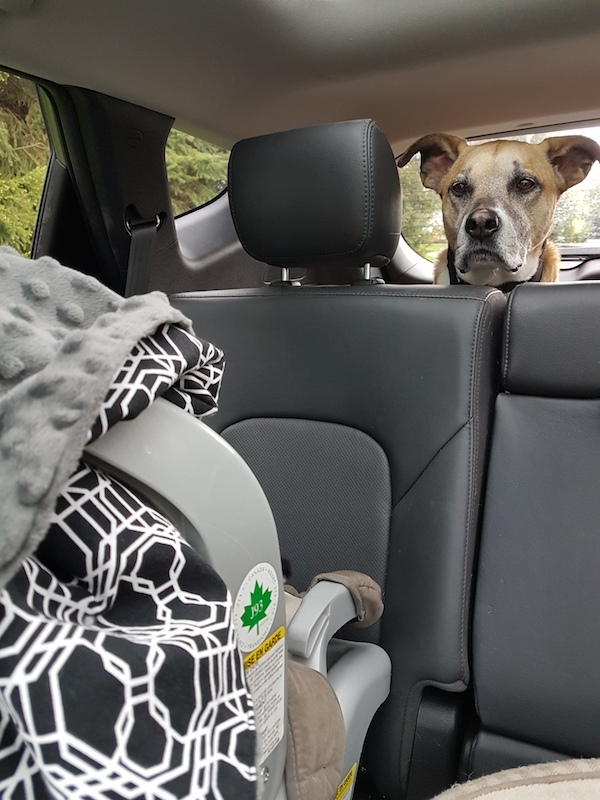 I also knew that I wasn’t comfortable having the baby and Bax ride together in the back seat of my car (his usual domain). That was a recipe for distracted driving for this Mama. Fortunately, I have an SUV, so I had another option—the trunk. Two months before our due date, Baxter began riding in the trunk. 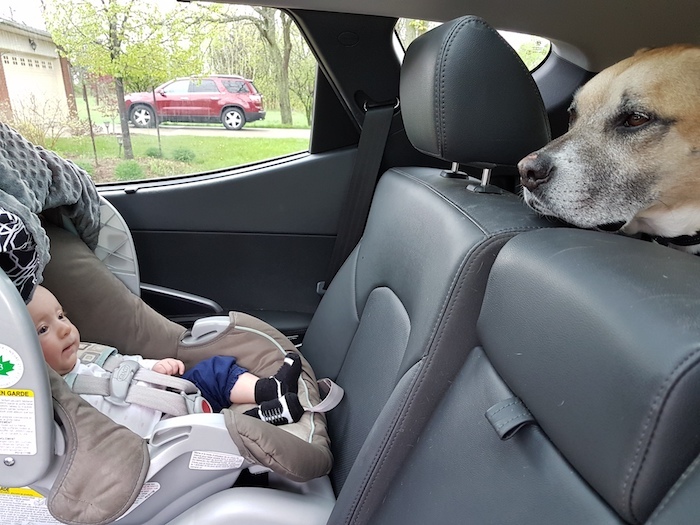 This was definitely something I wanted to practice, so that Baxter didn’t associate the baby with the end of his back seat privileges. The day before our first outing, I set up the area with one of Baxter’s dog beds, so that he had a spot that was clearly his. Then I invited him to hop up. He gamely leaped in and investigated the back of the car. Then I invited him to hop out and we went on with our day. It was important to me that he had an opportunity to check out his new domain before we drove anywhere. 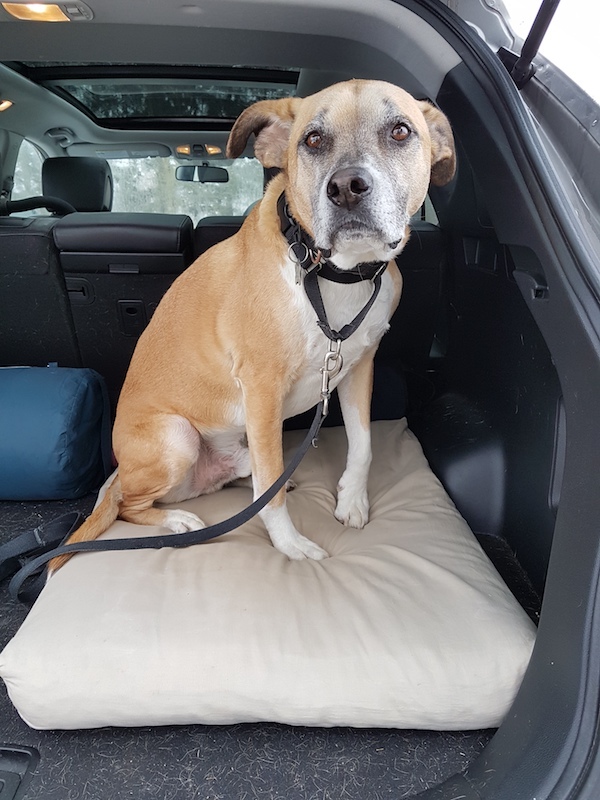 If you’re introducing your dog to a new car or asking him to ride in a new spot, treats may be helpful to encourage your dog to climb in and build a positive association for him with his new seat. The next day, we went out for the first time. Baxter was a little more whiny than usual (car rides usually involve some singing which I attribute to his excitement about going out), but overall he was calmer than I expected. He seemed to like looking out the rear window, and he could still monitor my driving from afar (he’s an avid backseat driver). I did not roll down the windows like I usually do because I don’t want cold air blowing on the baby. Baxter has had to get used to not smelling all the sniffs—which I still feel guilty about. This exercise was as much about training me, as it was about training him. We’ve chosen to skip a few things associated with dogs and cars. One, we don’t have a divider between the back seat and the trunk. There are some great options out there, but we’ve chosen to go without. When he rode in the back seat, Baxter never tried to climb into the front seat, even if he was waiting in the car by himself. I didn’t expect him to try to climb out of the trunk, and so far he’s behaved exactly as I thought he would. His biggest infringement on Ellie’s space is resting his chin on the back of the seat, which is actually pretty cute. Two, we also don’t have a harness or seatbelt for Bax. This is not something we’ve used before, and I’ve not invested in one yet. This may be something I investigate in the future. Check out Mighty Paw’s dog seat belt and vehicle safety harness. Lindsay uses a seatbelt for her pup Remy, an example of a dog who can’t sit still in the car! While the transition seemed to be relatively easy for Baxter, we did encounter a few challenges. The first was trying to figure out how to fit everything and everyone in the car. Half of the trunk is still available for cargo. However, we don’t have a divider there either, so I had visions of shopping bags sliding all over the trunk and into Bax. So far I’ve been making use of the backseat, which has been working alright. Any tips for how to segment a trunk? I was thinking of trying some large tubs or bins. Also, we’ve not yet tried a big trip with suitcases, a cooler or other luggage. I have a feeling Baxter might feel a little claustrophobic on our first road trip. The biggest packing challenge turned out to be the stroller. The stroller fits in the trunk. But it takes up the whole trunk. No room for Mr. B. Our solution ended up being to tuck the stroller behind the driver’s seat. It fits and rides securely, although it’s a bit awkward to get in and out. An additional challenge arose a few weeks into our trunk training – Baxter’s sore legs. A usual day out involves several stops, which meant multiple leaps in and out for Bax. By the time we got home, his back leg was obviously sore. He was hesitant to jump out of the car and had a serious limp for a few hours once he was out. The leap to the trunk is just a bit higher than jumping into the back seat, and it seemed to be too much for my seven year old dog, especially in the cold winter weather. Bax doesn’t love being picked up, and I don’t love lifting 60 pounds in and out of the car repeatedly—especially not when I was pregnant. I investigated ramp options and even built one myself. Now that the weather has warmed up, Baxter’s limp has gone away, and he leaps in and out of the trunk without hesitation, so we’ve set the ramps aside for now. We may return to them this winter. These few challenges aside, Baxter’s transition to the back of the car went better than I expected. Now he’s a backseat driver and baby monitor all at the same time, and I feel secure knowing everyone is safe and able to go out together. How does your dog travel in your car? Any tips for fitting cargo, dogs and children in a vehicle? Do you use a harness or a barrier? What’s your favourite kind? Let us know in the comments! That picture of Baxter resting his chin on the backseat IS adorable! Maybe you could have him wear a harness that attaches to the seatbelt and have him ride in the backseat area after all when you’ll be going on a road trip with the entire family and needing the trunk for suitcases and the stroller. 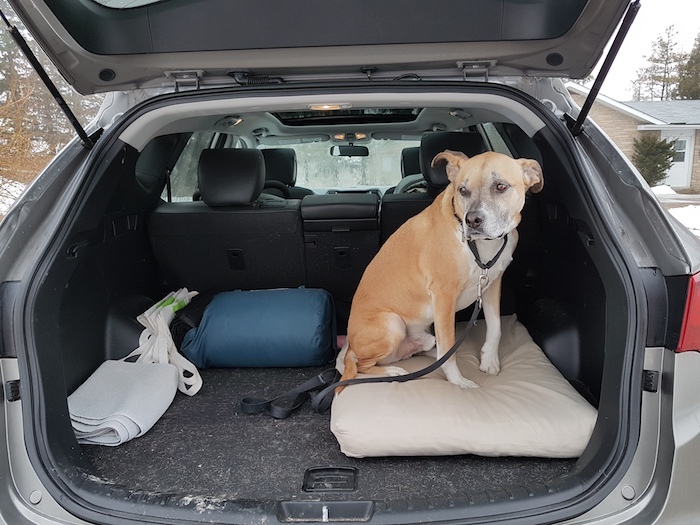 There are a few companies out there that make great, safe car travel accessories for dogs. 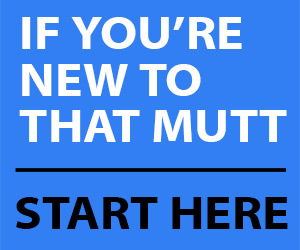 I’ve always used Ruffwear, but like you said, Mighty Paw seems to be offering products in that category as well. Oh yes, that’s a good idea now that Baxter is used to the baby. Isn’t it the best? I admit there’s a bit of a distracted driving as I watch him in the rear view mirror because he’s so cute resting his chin on the seat. Thanks for the suggestion of using a harness so they can sit together. The pet loader is what we use for dogs (even if it seems that they are doing okay-once they started having problems getting in and out, we just use these stairs on a regular basis). I got the biggest one because of the size of our vehicle at the time. They fold up and can easily be put in the backend of the car or truck. I have had mine since 2009 and they still work really well so paying a little more for the initial investment was worth it. I see now that I revisit their website to write this comment that they have different kinds (little dogs and big dogs and even one for a boat). The reason I went with stairs instead of a ramp was that I had dogs that did not like a ramp without sides and I was not having any luck finding a ramp that had sides for big dogs (I had dogs that weigh 140 lbs, 120 lbs and 90 lbs when I purchased it). Thanks for your suggestion. With our storage space challenges I like that the pet loader folds up so compactly.